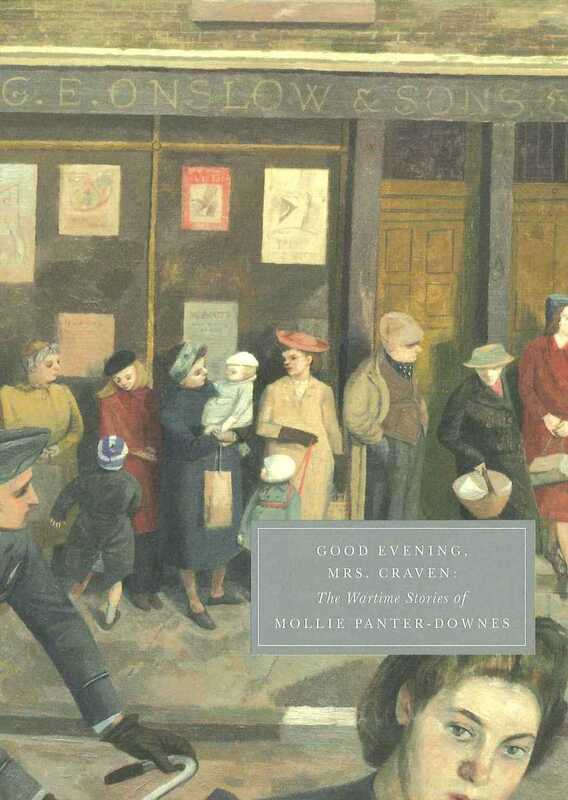 Serendipity Reviews: Good Evening, Mrs Craven: The Wartime Stories of Mollie Panter-Downes. Good Evening, Mrs Craven: The Wartime Stories of Mollie Panter-Downes. The Red Cross sewing party met twice a week in Mrs Ramsay's dining-room to stitch pyjamas, drink a dish of tea, and talk about their menfolk. Mrs Ramsay found pretty soon that she was in possession of all sorts of unsuspected facts about the husbands of the village. If I ever spot a Persephone book in the library now, I don't think twice about not picking it up. It is almost an instant reaction now. This book is made up of short stories which were among the collection of stories Mollie Panter Downes wrote for The New Yorker during the Second World War. The stories are bookended by two letters, one signalling the beginning of the war and one acknowledging the end of the war. This book consists of 21 of the stories that were published and quite frankly, that wasn't enough for me. I long to see more of these stories published. Now you know I don't normally read short stories, but this book really opened my eyes. I absolutely loved this collection. The book was just fantastic. As the stories progress,you get a real feel of how the war changed the people enduring it. You watch as the characters in the stories move from uncertainty,to quiet and solemn victory. I don't think I have really read many books about the Second World War, but this book left me with a thirst for more. I think the feeling that got me most during the book was the feeling of sheer loneliness. I never considered how young couples and families felt during those long years of separation. I can't imagine how I would have felt if my husband had been sent away for so many years. It must have been so hard on the women left behind and the men returning after such a long absence. One of my favourite stories within the book is the one the book is named after. Good Evening, Mrs Craven tells the story of an affair. The couple met regularly before the war, one night a week, where they would dine at Porters before returning to the mistresses apartment. The relationship progresses over a period of time, until the war separates them. The mistress realises that she will never know if he is killed in the war, as she isn't his wife. This story gives you a real sense of the loneliness that war caused and the time wasted by families putting their lives on hold until the war ended. I really enjoyed this book and found it gave me a real sense of how people reacted and felt during the war. How time didn't stand still whilst the war was raging and how life changed so dramatically for all concerned by the end of it. Another wonderful book by Persephone. Can't wait to get my hands on the next one. I've been wanting to read this one, but there are no copies in my library system. Think I may have to break down and order it - great review! This sounds like an excellent book! I actually don't think I've ever read a collection of short stories, but I think I would like to try this one. It kind of reminded me of the novel The Guernsey Literary and Potato Peel Pie Society. I also think that it must have been hard on the men coming back, many of them was perhaps changed for ever because of the horrors they must have seen during the war. Not a short story fan either but I'm tempted by this. I'm going to have to ask you to stop reviewing books Vivienne as we seem to have similar tastes which means my wish list is getting almost as big as my tbr mountain. Thanks also for recommending Times Legacy, it's one of the Barbara Erskine books I have somehow missed. Still haven't read a Persephone book! I know! I know! I should be banned from the book blogging community. I've not read one either and must admit I've not seen them anywhere except for you book bloggy lot getting me interested. This does sound a good 'un. I'd say I'll keep my eye out for it buit think I'll just keep my eye out for Persophone books in general. Blodeuedd - it must have been so lonely for them all. Imagine being parted from your families for years. JoAnn- it is definitely worth reading and I am really not a short story fan. Ladybug -good point, I didn't even mention how traumatised and changed the men would be after their years spent at war. Petty Witter - LOL, I will try to stop reading and reviewing to make it easier on you. I shall have to put up my Time's Legacy review next week. Christina - I think Persephone is quite a British institution. They are not widely available, are they? Carmen - just look for the grey covers! I think short stories would be perfect for a book about war, because there are so many stories to be told from that time. The story about the affair sounds so sad. I have thought about the loneliness aspect, but not about what it would be like for someone in that situation. Pleased you enjoyed this one, Vivienne! It's a lovely short story collection - did you know that there is also a Peacetime volume? Good luck on finding the next Persephone. Oh Vivienne, what a wonderful review!!! If Ana hadn't already made me add this to my wish list, you surely would have. This just sounds like such a great read. Kathy - you are so right.Everyone has a story to tell if they experienced war. Alyce - neither had I until I read this. When I think about the world war or any war, I just think of the devastation and the people killed, I had never considered the effects on the people who survived. Although they would be joyous the war was over,they would still have to deal with getting to know each other again after long periods of separation. PaperbackReader - oh wow.I didn't know there was a Peace time one, I shall definitely look out for that now. Debi - Ana is my inspiration. Can't wait for her to come back. Good Evening, Mrs Craven was my personal favourite from the book as well! You're so lucky to have Persephone titles at your library, my library is far to enamoured with Nora Roberts and Danielle Steel. I have got to look for this one for my wife for Christmas. She loves stories set in and around WWII and this one will be right up her alley. Great review. I've been wanting to read this book since seeing it on Ana's blog. Glad to see you liked it as well. I hope it's okay to link to your review on the WWII book reviews page on War Through the Generations. I just ordered this from Book Depository to put under the tree this Christmas for Mary.